In this third week of Learn the Flowers CSA, I rose to watch the sunrise on my drive to the farm around 5:45 am and was snapping pictures and cutting stems by 6 am. I wanted to make sure I had ample time to harvest during the coolest hours of the day. Especially on the hottest of summer days, it’s extremely satisfying to feel the subtle coolness on my skin and breathe in the morning air in those precious early hours that most people miss. Even though it can be painful to roll out of bed at 4:30 am, I manage to get energy from catching the world around me in a calmer, quieter, darker state. (The post-work afternoon naps also contribute to sufficient energy levels!) It also means, happy, unstressed flowers for you! This weeks journal focuses in on Tansy and Ammi. 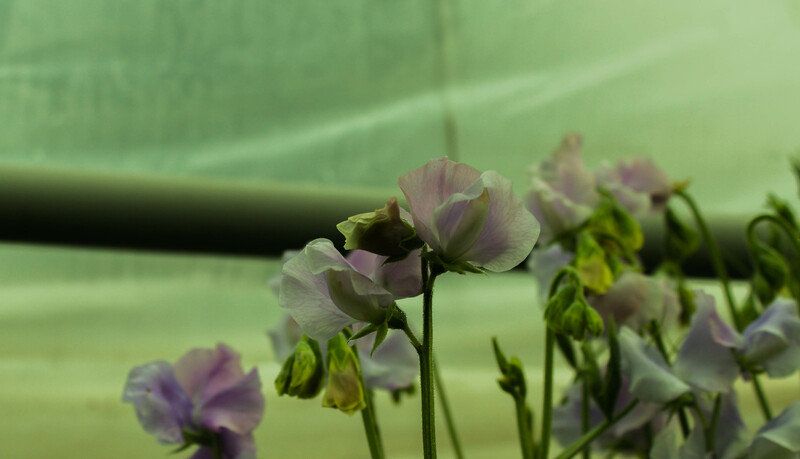 I will also give a brief overview of my experience growing Sweet pea flowers in the form of a eulogy, as this week’s heat has prompted their demise. 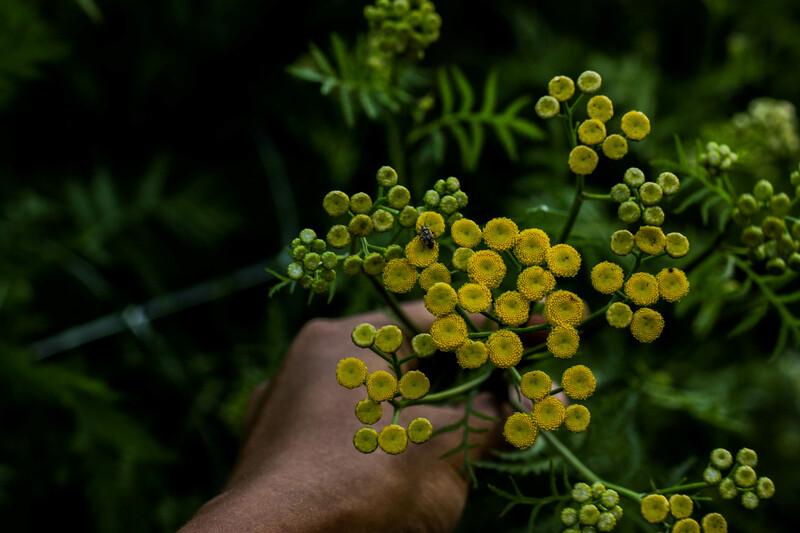 Tansy is a perennial flower, which means that it is a plant that blooms for more than two years, dying back in the fall or winter and returning in the spring to bloom again in summer. One of its adorable (and appropriate) nicknames is Golden Buttons. It’s less adorable nickname is Bitter Buttons. The flower and leaves are considered toxic when ingested in large amounts, so please don’t eat the Tansy in large amounts. 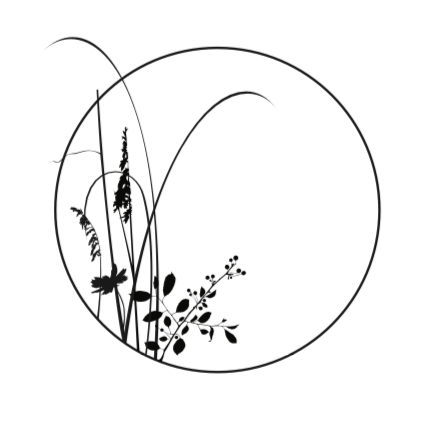 Its history as a medicinal herb ranges from ridding the body of parasitic worms to reducing menstrual cramps. I don’t particularly enjoy the smell of Tansy as it contains some Camphor. For this reason, there also exist organic insect repellants containing essential oils obtained from the plant. So if you’re getting some insect pressure in your garden, either plant some Tansy near the plants being attacked (by beetle or aphid, for example) or mix up a recipe of Tansy and other oils to spray directly on your plants. Also as a repellent for flies and mosquitos, try spraying or planting Tansy around your porch and doorways. However, the tradeoff is that your porch and doorways will smell like Camphor afterwards. Our Tansy grew to be quite taller than us at the farm this season and became heavy and needed to be propped up by stakes and rope. Now we know it’s a plant that can be pinched at the beginning of the season to avoid a monster crop. Ammi is in the Apiaceae family which is also the family of carrots, celery, parsley, cilantro, dill, and anise. All of the plants in this family have an umbel inflorescence forming a flowering, umbrella shape. In last week’s journal I mentioned that the stem of dill is hollow and since ammi is in the same family, it shares this hollow characteristic. 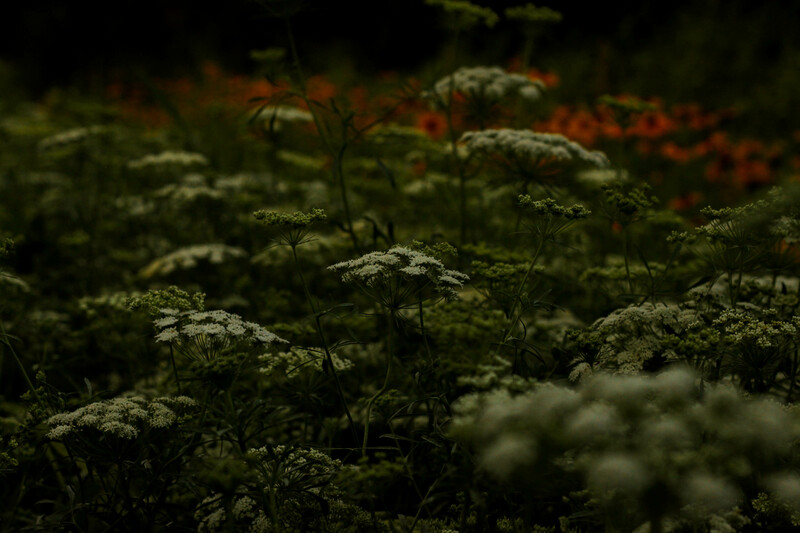 For this reason, when harvesting either dill or ammi flowers, one needs to wait until the hollow stem has had time to mature a bit in the field before cutting, otherwise its thin hollow sides will be softer and cause the stem to be weak and wilt after cutting. 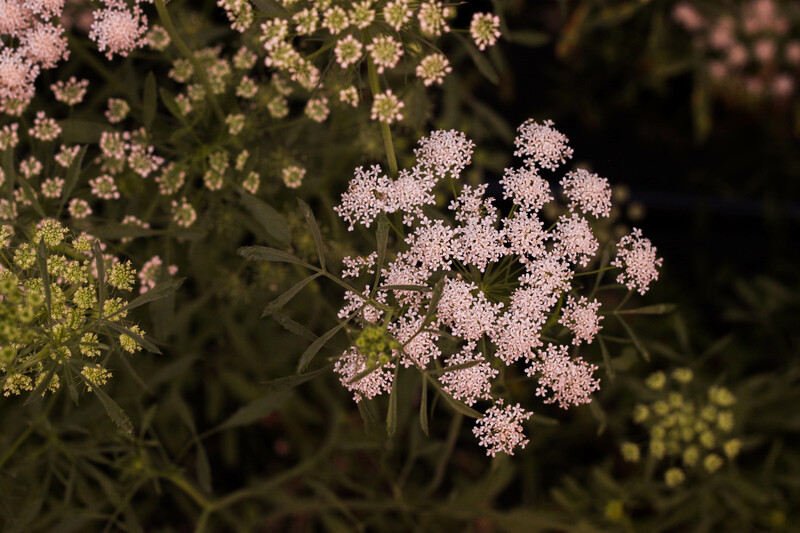 Ammi has become a very popular flower for floral design use since it comes in white and more muted colors and has a very beautiful “wildflower” look to it. It also grows well in a bed where there’s full sun and good drainage. It’s an easy choice, in my opinion, to grow and add to any floral design. Lovely Sweet peas: You came to me as small, brown seeds and I prepped the start of your lives with soil, lights, heat and water. You popped up small and green through the soil and I watched and documented your movement upward towards the light in those early, cold days. As soon as the ground began to thaw, I prepared a bed enriched with leaves, compost, and calcium to help you grow big and strong. I set up protection around you against bunny, deer, and slug. A frost came without warning and if it weren’t for the thick blanket of leaves tucked in around your freshly-transplanted shoots, you would have died completely. You survived beneath the blanket and slowly began your journey upwards, climbing. When you had climbed almost 4 feet high, you produced small pods that I watched eagerly each day to see the shape and color that would follow. That first morning I saw those delicate, lavender petals, I was smitten. The first time I gathered a handful of those petals all together and breathed in deeply, the sweetest, yet subtle fragrance filled my senses and I loved you more. The cool mornings and evenings of spring brought about longer, stronger stems and more beautiful petals. You were at your best in June. As the days have grown longer and hotter, you’ve looked weaker and stressed. And now as you make your final descent in the summer heat, we’ll gather the lovely work of your vines to admire and enjoy. Thanks for letting me indulge by giving my beloved sweet peas a proper farewell. Also, don’t forget to place this week’s bouquet in a cool place, occasionally changing out the water and trimming the stems. Enjoy!